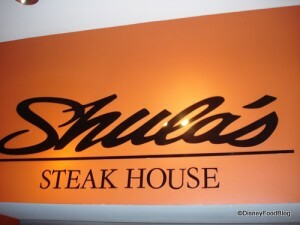 Shula’s Steakhouse, named after owner and American football great Don Shula, has honed its restaurant presentation to be dark, mature, and indulgent. The food portions here are extremely generous, and it is my sincere hope that you don’t mind indulging in decadent steaks, side dishes, and desserts if you’re choosing to dine here. It’s a truly magnificent meal, but not for the faint of heart! The menu has several cuts of steak, massive side dishes, and some truly delectable desserts. With an 8-oz lobster tail listed as an appetizer, you’ll see what I mean. Many of the side dishes even incorporate seafood for added indulgence. Hungry? Finish the 48-ounce Porterhouse and you can get your name on a plaque! This place is extremely dark; consider bringing a little flashlight on your keychain to read the menu…I’m not kidding.